Three Clark School engineering professors are partnering with Innovative Biosensors, Inc. (IBI) on new $1.8 million grant to develop a handheld device for detecting pathogens from the National Consortium for Measurement and Signatures Intelligence (MASINT) Research NCMR. Assistant Professor Pamela Abshire (ECE/ISR), Associate Professor Benjamin Shapiro (AE/ISR), and ECE-affiliated Associate Professor Elisabeth Smela (ME) will be contributing their research on cell-based sensors to the project. 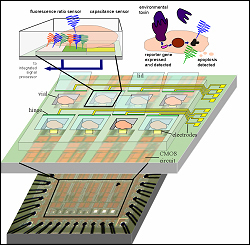 "Handheld Cell-Based BioSensor for Complex Samples" will develop a miniaturized analysis system that could be used in industrial, environmental and clinical fields. The problem with biochemical weapons detectors is their unacceptable number of false positives. Existing detectors are easily fooled because they cannot distinguish between the subtle ways pathogens interact with biological systems. To solve this problem, Shapiro, Abshire and Smela's research uses biological systems that incorporate real cells to spot the pathogens. The cells are exposed to potential pathogens in the air via a semi-permeable membrane. Much like a canary in a coal mine, these cells die when exposed to a particular pathogen, triggering an early warning. They also are engineered to produce a signal, such as fluorescence, when attacked. The system quickly realizes pathogens are present. The cells are stored on a chip that keeps them alive and monitors the light they produce. IBI is a company developing rapid, ultra-sensitive tests to detect harmful pathogens for both the biodefense and clinical infectious disease markets. IBI began at the University of Maryland’s Technology Advancement Program (TAP) Incubator, a Clark School initiative managed by the Maryland Technology Enterprise Institute.